Greetings and welcome back to and from Uncle Tom’s Corner. 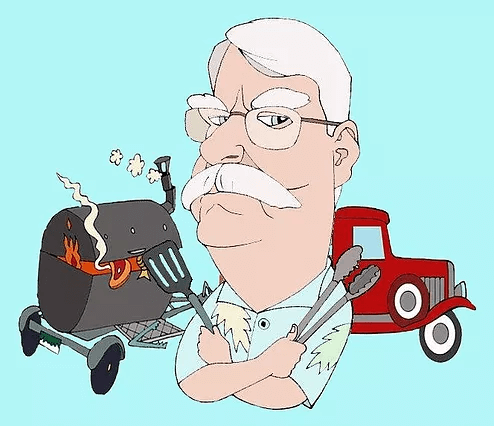 As previously mentioned, there isn’t much going on in the competition barbecue world so sometimes it just makes more sense to leave “the Corner” alone rather than trying to fake it. Fortunately, having just averted another Cyclone Bomb and Spring having both officially and unofficially arrived, it just might be time to dust off the grill and smoker and get after it. In the competition and judging world the next one up is in Brighton. After several months off (the last one was the Stock Show) it’ll be great to sink my teeth into it again…literally and figuratively. Then in May is the Lamar competition, a rib contest at the Gothic Theater, cook for the neighbor kids’ graduation and we’re into summer. My, how time flies when having fun. But before all that I have a couple of recipes involving the smoker to share. Realizing that not everyone celebrates Easter I’ll start with lamb prepared on the smoker. Prepare the glaze. Bring all glaze ingredients to a boil in a skillet set over medium-high heat. Boil, stirring occasionally, for 5 to 7 minutes or until glaze is syrupy but not too thick. Prepare the lamb loin chops. Preheat the grill to medium, grease the grate well (side note: Have you tried Grill Grates©? They’re pretty awesome and make for some incredible grill marks.). Brush lamb chops with oil. Season with Chinese 5-spice powder and salt. Grill chops for 2 minutes per side, turning occasionally. Continue to grill chops, turning and brushing with half the glaze, for 3 to 5 more for medium, or cook until the internal temperature registers 145⁰ Let chops rest for 5 minutes. Serve with remaining glaze. Makes 2 to 3 servings. Use a sharp knife to make a number of slits in the skin and all over the outside of the ham. This will help the rub to stick to the ham and help the skin render better. You can apply a thin coat of yellow mustard or Que Glue© (available from Savory Spice) as an adherent for the rub. Combine the ingredients for the rub together and rub all over the ham. Place the ham in the refrigerator overnight, skin side facing upwards, uncovered. The next morning, set up the smoker for a 6 hour cook using pecan wood chips, chunks or pellets. Cook at 250⁰. .4. While the smoker gets going, remove the ham from the refrigerator. If there is any leftover rub, re-apply it to the ham as much as possible. Let the ham set on the counter for about 20 minutes. Combine the ingredients for the glaze in a large saucepot. Reduce the glaze to about half the volume (should take around 25 minutes on low flame). Remove from the heat source. When the smoker reaches 250⁰ place the ham in the smoker skin-side down. The skin will act as an insulator and prevent the bottom of the ham from drying out. To prevent the top of the ham from drying out you can spray it every 45 minutes to an hour with apple juice. Make sure your sprayer is set to “Mist”…not “Stream” because you don’t want to rinse off the rub you so carefully applied in Step 2. If you’re using one of the newer digital thermometers now would be a good time to insert the probe(s) into the meat so you can monitor the internal temperature as it rises. Try to maintain the 250⁰ at a constant in your smoker. Cook the ham for about 2 hours, then glaze generously with some of the glaze. Close the lid and smoke another 2 hours. Glaze once again. If you’re using a regular digital thermometer begin checking the temperature after about 5 hours. Check the temperature in at least 3 places. When the ham hits 165⁰, remove from the smoker and place in pan and tent with foil. Let rest for 15 minutes. For the glaze, combine the rest of the ingredients in a saucepan and cook over medium heat, stirring frequently until its reduced to about 1 cup. Remove the ham from the smoker and increase the temperature to 350⁰. Brush the ham with 1/3 of the glaze and heat until the glaze becomes sticky…maybe another 10 minutes. Finally, remove the glazed ham from the smoker. Brush on another third of the glaze and slice. Add any juices from the non-reactive pan to the remaining glaze and cook over medium heat until its thick but fluid. Server this separately from the ham. And that, Sports Fans, about wraps up another episode of Uncle Tom’s Corner. Enjoy the roller coaster that is Colorado springtime weather. Its been my observation through these many winters that we often get one more good snowstorm after Easter so don’t put the snow shovel away just yet. Until next time, see ya through the smoke.